These new MG mixers are lighter and smaller than ever while offering some innovative new features. The MG102C and MG82CX are ideal mixers for basic music production or live sound applications that require high sound quality from a relatively small number of input sources. Both models are remarkably compact and lightweight, but no compromises have been made in sound quality. They even have built-in channel compressors that, although easy to operate, can significantly enhance the quality of your mixes. An optional adaptor allows these mixers to be mounted on a microphone stand for easy access and convenient positioning on stage. The MG82CX additionally features top-quality SPX digital effects built in, so you won't need any extra equipment for many applications. Many real-world mixing applications only involve a few channels, so a small mixer is the obvious choice. But no matter how simple the setup, you'll always want first-rate audio quality and processing capability. The MG82CX and MG102C are the ideal choice for small music production or live sound applications, offering sonic quality that will satisfy the most critical listener, surprising flexibility and ease-of-use, and some advanced features you normally wouldn't find in this type of compact mixer. So whether you need a compact main mixer, or a secondary utility mixer for a larger application, don't overlook these performance-packed models. The MG82CX has a total of 8 input channels comprised of two mono microphone/line channels and three stereo line channels. The MG102C has an addition stereo channel for a total of 10 input channels. On both models two of the stereo channel can be used as mono microphone inputs, providing a total of four microphone inputs when necessary. Gain trim covers a wide -60dB ~ -16dB range for microphone input, and -34dB ~ +10dB for line input. Top-mounted input and output connectors make setting up and re-patching your system quick and easy. Both models feature high-quality Neutrik™ balanced XLR connectors on both mono microphone/line channels and two of the stereo channels. The XLR-equipped stereo channels can accept mono microphone input either via the XLR or phone jack connectors. The remaining stereo channel on the MG82CX and the remaining two stereo channels on the MG102C provide phone jack and pin jack connectors for compatibility with a wide range of sources. The two mono input channels also feature insert I/O connectors that let you patch external signal processing gear into those channels as required. Separate pin-jack 2TR inputs are provided to accept the output from a CD player or similar stereo source. This advanced feature can be a tremendous advantage in achieving great vocal sound. It can also be used to refine the sound of bass, guitar, and other sources. You won't find built-in channel compression on too many other mixers in this class, but in the MG82CX and MG102C you have Yamaha's innovative one-knob compression feature on mono input channels 1 and 2. Conventional audio compressors with their threshold, ratio, knee, makeup gain and other controls can be complex and time-consuming to set appropriately for a given source. Yamaha's one-knob compressor eliminates the need for an engineering degree with a single control that lets you simply dial in the amount of compression you want. Building a truly useful, musical-sounding channel equalizer is no easy task, but Yamaha has decades of experience in building pro consoles to draw on, and you reap the benefits in the MG-series mixers. Channels 1, 2, 3/4, and 5/6 feature full 3-band equalizers with LOW, MID, and HIGH controls, while channel 7/8 on the MG82CX and channels 7/8 and 9/10 have 2-band EQ for smooth equalization of stereo sources. The MG82CX has EFFECT send controls on all channels that adjust the level of the signal sent from the corresponding channel to the mixer's internal multi-effect system. The same signal can also be sent to external effect processors via the mixer's EFFECT SEND jack. The MG102C has AUX send controls on all channels in place of the MG82CX EFFECT send controls, and these adjust the level of the signal sent from the corresponding channel to the AUX SEND jack that can be used to feed external effects or a monitor system. A RETURN control in the master section of both models adjusts the level of the signal returned from external processors via the RETURN jacks. Located above the mixer's master controls, on the convenient easy-access connector panel, are the main stereo output connectors, phone-jack monitor output connectors, pin-jack recording outputs, and a stereo headphone jack. They may be compact, but these mixers offer plenty of connectivity for a wide range of applications. The MG82CX and MG102C weigh only 1.6 and 1.5 kilograms, respectively. That's small enough to pop into your briefcase or shoulder bag and easily take with you anywhere. But the performance you'll get at the studio, club, outdoors, or anywhere you choose to use these fine mixers is far from lightweight. Both of these compact models can be mounted on a microphone stand for optimal positioning and easy access using the optional BMS-10A Mic Stand Adaptor. 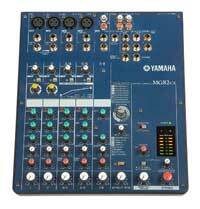 This can be particularly handy when using the mixer as sub-mixer for drums or as a cue box in recording situations.